A booming metropolis, Atlanta, GA is the place to live and invest in. A 2018 U.S. News & World Report ranks the city as the 47th best place to live in the country. People have been drawn to Atlanta for generations. Dubbed the “city in a forest,” more than a quarter of its area is blanketed with trees, and it ranks among the greenest big cities in the country. Atlanta is also a major economic hub, one of the fastest growing in the United States, as well as a cultural powerhouse, with everything from globally recognized performing venues to state-of-the-art museums and galleries. Premier retail destinations such as Lenox Square and Phipps Plaza make the city a haven for those who enjoy brick-and-mortar shopping. It also boasts a dynamic and exciting culinary scene, recognized as one of the best in the US. One of Atlanta’s most striking features is its collection of culturally diverse neighborhoods. Some of these communities are in the midst of revitalization, breathing new life into an already vibrant city. Atlanta is the best place to be, and now is the perfect time to move here. This community guide has everything you need to know about Atlanta. Let this be your starting point as you dive deeper into Atlanta real estate. For more insider information about Atlanta, GA real estate, get in touch with us today. Atlanta is home to over 200 distinct neighborhoods, spanning Fulton and DeKalb Counties. Here are some of the city’s most notable communities. Intown generally refers to the area composed of Atlanta’s most central neighborhoods. This makes it one of the most popular places to live in the city. Midtown is best known as Atlanta’s center for arts and culture, which has earned it the distinction of being the city’s “Heart of the Arts.” The area is home to both historic estates as well as new construction. Ansley Park is an affluent enclave founded in 1904 by its namesake, Edwin P. Ansley. Many notable Atlantans have resided here, including “Gone with the Wind” author Margaret Mitchell. Featuring homes built on a grand scale, Ansley Park is listed on the National Register of Historic Places. Atlanta’s East Atlanta community is home to some of the city’s trendiest neighborhoods. Locals see East Atlanta’s storied past converging with the new energy flowing into the city. It’s been called “hip, eclectic, and a little bit eccentric,” making it one of the most exciting districts in Atlanta. Leafy Candler Park was founded in 1890 as the neighborhood of Edgewood and is one of the very first suburban areas in the city. It was rechristened Candler Park after Coca-Cola founder Asa Griggs Candler donated a 55-acre park with the same name. The neighborhood features 1920s Craftsman-bungalows and a sprinkling of other late Victorian and Edwardian-era homes. Located in a portion of Atlanta that’s in DeKalb County, Druid Hills is one of the most fascinating places to live in the Metro Atlanta area. It has the distinction of being one of Atlanta’s first suburbs, designed by Frederick Law Olmsted in 1893. This community offers everything from modest single-family residences to stately homes. The city of Decatur in DeKalb County is so close to Atlanta that it’s often mistaken as one of the city’s many quaint neighborhoods. Decatur, however, can stand on its own. It has its own top-performing school district, annual events, and award-winning restaurants. Housing options include ranch-style homes, early 20th century single-family homes, and new construction. In the 1880s, real estate developer Joel Hurt created Inman Park, Atlanta’s very first planned community. Today, this forested neighborhood is not only an attractive place to live, it also hosts the Inman Park Festival, one of the most highly anticipated events in the city. What’s been called “one of the world’s coolest neighborhoods” offers mansions, smaller homes, and historic dwellings. Another one of Atlanta’s neighborhoods that’s located in DeKalb County, Lake Claire is a picturesque community tucked behind lush, old-growth forests. It is a small locale of approximately 1,200 architecturally diverse homes. Morningside was developed in the early 20th century, making it one of Atlanta’s oldest neighborhoods. This highly walkable community is home to an array of sought-after properties, public parks, and locally owned cafes and shops. The prevalence of Jacobean and Tudor Revival architecture gives Morningside a charming English village feel. Ask locals about their favorite Atlanta neighborhoods and Virginia Highland will probably be top of mind. After all, this community is one of the most vibrant parts of the city. It has its own exciting nightlife and some of the best restaurants in Atlanta. Boutiques alongside historic Craftsman and Victorian homes add to Virginia Highland’s appeal. The Buckhead district is synonymous with luxury living in Atlanta. Dubbed the Beverly Hills of the South, the area is home to upscale shopping and residential developments as well as an award-winning dining scene. Buckhead’s collection of affluent neighborhoods makes it one of the go-to markets for mansions for sale in Atlanta. The city of Avondale Estates in DeKalb County is a beautiful suburban community inspired by the English town of Stratford-upon-Avon. As a result, Avondale Estates has an impressive number of Tudor-style buildings throughout the city. This checklist will help you choose the Atlanta neighborhood that best fits your lifestyle. The capital of Georgia, Atlanta is located in Fulton County, where it also serves as the county seat. Some parts of the city, however, are in DeKalb County, such as the neighborhoods of Lake Claire and Druid Hills. In total, the city occupies an area of approximately 134 square miles. Like the rest of the South, Atlanta experiences hot and humid summers. Winters are mild and rarely drop below zero. Rainfall occurs all year ‘round, keeping the greenery of Atlanta lush and vibrant throughout the year. In the central areas, the green spaces help cool the city down. Atlanta is one of the fastest growing economies in the country and the world. It is home to a diverse array of industries that lure in bright, young talents as well as experienced professionals. The finance, media, transportation, and information technology industries have found Atlanta a hospitable place to do business. The city hosts corporate headquarters, regional offices, and the like. Atlanta has a complex network of public transportation systems and freeways allowing commuters ease of access in and out of the metro. The Metropolitan Atlanta Rapid Transit Authority (MARTA) is the city’s main transportation provider. It also remains the best option for city travel, with stations scattered all across the city. MARTA has yet to expand to Atlanta’s suburbs, however. Another popular option is the Atlanta Streetcar. Launched in 2014, it operates in the Downtown area. Plans to expand its services to central Atlanta are in the works. There are also a rising number of cyclists in the city. As a result, more cycling and walking paths are being developed and bike-sharing programs are sprouting across the city. Atlanta is home to the Hartsfield-Jackson Atlanta International Airport. Known as the busiest airport in the world, it is the main hub for domestic and international flights in the Southeast. Educational opportunities abound in Atlanta, where there is a great variety of public and private schools. The city is mainly served by Atlanta Public Schools, which has over 100 institutions under its wing. Some parts of Metro Atlanta are also served by DeKalb County School District and Decatur City Schools. Atlanta is a leading center for higher education in the region, with over 30 colleges and universities located within the city. The most notable include the Georgia Institute of Technology, Emory University, Georgia State University, and the Atlanta University Center, a consortium of historically black colleges. The Savannah College of Art and Design and the University of Georgia also have campuses located in the Metro Atlanta area. Credit Atlanta’s history and diversity for its dynamic arts and culture scene, which enhances the quality of life of its residents. Atlanta is home to a large number of museums and galleries. Atlanta History Center. Located in Buckhead, the Atlanta History Center is a 33-acre museum housing some of the most important exhibits on local history. The sprawling grounds also host a variety of attractions, including the historic Swan House. Center for Civil and Human Rights. This cultural attraction tells the story of the American Civil Rights Movement through interactive exhibits. Children’s Museum of Atlanta. The largest of its kind in the state, this museum is one of the best places for kids to “discover the power of play.” You can find more family-friendly attractions and activities here. High Museum of Art. Classic and contemporary art shine in this museum, notable for its sleek and modern design, the result of a collaboration between Renzo Piano and Richard Meier. For more suggestions on cultural venues, click here. Annual events and seasonal festivals play a huge part in Atlanta’s community life. Atlanta developed a dining scene so award-winning and diverse, it established itself as one of the premier culinary destinations in the Southeast. In 2017, the restaurant guide Zagat named Atlanta the 9th most exciting food city in the US, while Southern Living ranked it as one of the South’s best food cities. You’ll find everything in Atlanta, from familiar all-American classics to the most soulful soul food in the US. Scour Metro Atlanta for the best brunch spots in the city, or go on a gastronomic adventure along Buford Highway. Atlanta is not only covered by a dense canopy of trees. It is also home to more than 3,000 acres of parkland and an intricate web of multi-use trails. One of the most prominent green spaces in the city is the Atlanta BeltLine. Although it’s technically not a park, this former railway is now a popular destination for outdoor recreation in the metro area. 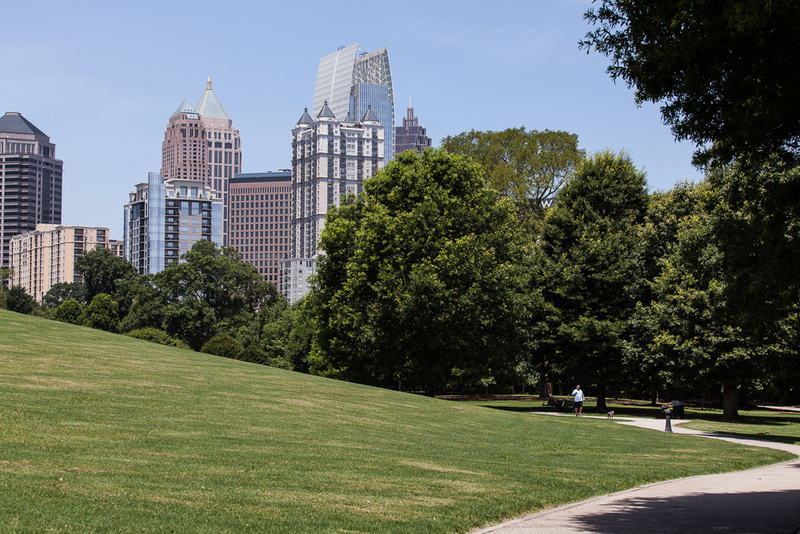 Check out this article for a primer on Atlanta’s best outdoor attractions. Make the move to Atlanta! Living in Atlanta might be the best decision you’ll ever make. Connect with us todayand let us help you explore the exciting possibilities in Atlanta, GA real estate. Call 404-550-5113 or email Natalie(dotted)Gregory(at)Compass(dotted)com for more information.